In light of the Budweiser Super Bowl commercial (that I actually haven't seen too much of, in comparison to that dumb Doritos commercial that just keeps playing!) that featured Prohibition, I wanted to take a look at Ken Burns' documentary about the era. I've been a big fan of his since I took a Docudrama course in graduate school, and looked forward to his Prohibition documentary from July to October last year. Well, it took me a while to find the time to watch it (make no mistake, it is indeed six full hours), but I'm glad that I did. I mean, I learned about Prohibition as much as the next kid in my American History course in high school, but this went into such greater depth! The first two hours alone don't even touch the 14 years of Prohibition - that segment is about the events that led up to Prohibition waving through the country and getting passed. The documentary received excellent reviews overall, though there were historical accuracy concerns posed by some. The entire three-part adventure is available on DVD (and thus, Netflix), but if you're not sure whether you're ready to sit through the story, here's a basic run-down of some of the many, MANY facts included. Part 1: "A Nation of Drunkards"
- Theoretically, Americans drank way more alcohol 150 years ago than we do now. It's been said that Americans routinely drank at every meal, including breakfast, that many towns had bells ring twice a day for "grog time," and that( in 1830) the average American over age 15 was drinking 88 bottles of whiskey per year... 3 times as much as we do now. - On April 5th, 1840, six friends pledged that they'd never drink again, beginning a society of sorts for Reformed Drunkards. These soon sprang up across the country (it wasn't long before 500,000 people were signed up! ), making alcoholics accountable to one another. This was problematic to many, as these folks essentially believes that they could reform one another outside of the church. So, in response, church-based organizations sprang up, complete with separate organizations for African Americans. To avoid ever needing such services, tens of thousands of children enlisted in the Cold Water Army, pledging to never drink alcohol. - On June 2nd, 1851, the Maine legislature voted to prohibit the sale and manufacture of intoxicating beverages. To get around this, bartenders began charging for salted crackers and threw in free drinks, and physicians wrote prescriptions to pad their incomes. Other states followed suit. This idea didn't last, however, as all of the states removed their laws by 1860. - Following the Civil War, the United States had a large influx of immigrants, with their own drinking habits. This led to debates over what type of alcohol and how much was acceptable. So, the nation went from drinking 36 million gallons in 1850 to 550+ million gallons in 1870. - On December 23rd, 1873 - an Ohio mother lost her son, a clergyman, to alcoholism. She led a campaign to ask drugstores not to fulfill doctors' prescriptions for alcohol, and some even agreed to stop alcohol sales completely. The Women's Crusade erupted in Ohio, and soon spread. ~1300 liquor sellers were closed across 31 states and territories. The Women's Christian Temperance Union soon formed, who installed water fountains in village squares and public parks. The organization eventually grew to 45 departments, dealing with votes for women, orphanages, raising the legal age of consent from 10 to 16, equal pay for equal work, and more. There were Temperance classes (full of misinformation designed to terrify) three times a week across the country! - By 1900, there were about 300,000 saloons, including those that were brewery-owned - a situation where breweries would pay a lot of a saloon's bills as long as they agreed to only sell that brewery's beer. They were even able to offer free lunches of salami, cheese, and crackers, because the heavily-salted items would make them drink more beer. The Anti-Saloon League formed with the sole mission to try to get rid of saloons. The brewers paid taxes for blacks and Mexicans to vote in Texas, since it was thought that they'd vote for beer. And, because the government was dependent on taxes until the ratification of the 16th amendment (income tax), the brewers thought that they'd be safe. - Since people would just go to the next town or state to buy alcohol if local arenas prohibited it, the teetotalers would need the Constitution to back prohibition. By 1913, Maine, North Dakota, Georgia, and Oklahoma all restricted liquor state-wide. Kansas, Mississippi, North Caroline, Tennessee, and West Virginia followed suit. - The first vote in the House of Representatives for Amendment 18 was 197-190, meaning that both Democrats and Republicans were supporting prohibition. Virginia, Arkansas, Alabama, Nebraska, Oregon, Washington, Colorado, and Arizona were next to pass state-wide laws. However, the "drys" really only cared about the saloons, not the sale of alcohol at stores for home consumption. - Once the US entered World War I, a temporary limit on selling grains to breweries was enacted by both houses. On December 18th, the vote was 282-128, which sent the amendment to the states for ratification, which they had 7 years to do. On Jan 16, 1919, Nebraska became the 36th state to ratify the 18th amendment, and it would go into effect one year later. Just before the law went into effect, there were acts of armed robbery across the country, with people trying to get their hands on whatever whiskey they could. - As a result, tens of thousands of workers in the industry lost their jobs, and hundreds of thousands in related industries - waiters, bartenders, bottlers, barrel-makers, truckers. 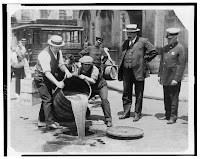 Part 2 "A Nation of Scofflaws"
- On January 16th, 1920, Prohibition went into effect, causing alcohol consumption to go down by a third, as did arrests for public drunkenness and related deaths. Brewers went into business making yeast, cheese, ice cream, and soft drinks. Coca-Cola stock more than doubled, non-alcoholic beers showed up, but because "intoxicating" was defined as anything with more than .05% alcohol, sauerkraut became illegal. -Drinking alcohol itself wasn't illegal - neither was making your own wine. The Italians were making wine from dandelions, for example. But there were still tons of problems - many people who supported Prohibition didn't know that it was going to limit beer (only 2% alcohol at the time) and light wines. While social clubs that had bought alcohol before the Amendment went into effect were allowed to keep it (so the rich were well-stocked... the Yale Club had enough to keep their members drinking for 14 years! ), others began to scrounge around for their fix. Medicines that included alcohol remained in business, and you could get one pint every 10 days from a medical professional... which led to over 6 million prescriptions for it during the Prohibition era! Plus, because sacramental wine was allowed, churches over-bought what they needed. People also pretended to be rabbis, as a certification from a rabbi could also get your family some alcohol... which made 10x more people "belong" to the synagogues! - Bootlegging became a big deal... even the Capitol bought liquor that way! When Harding became president in 1921, his poker games had whiskey from a bootlegger outside the White House! 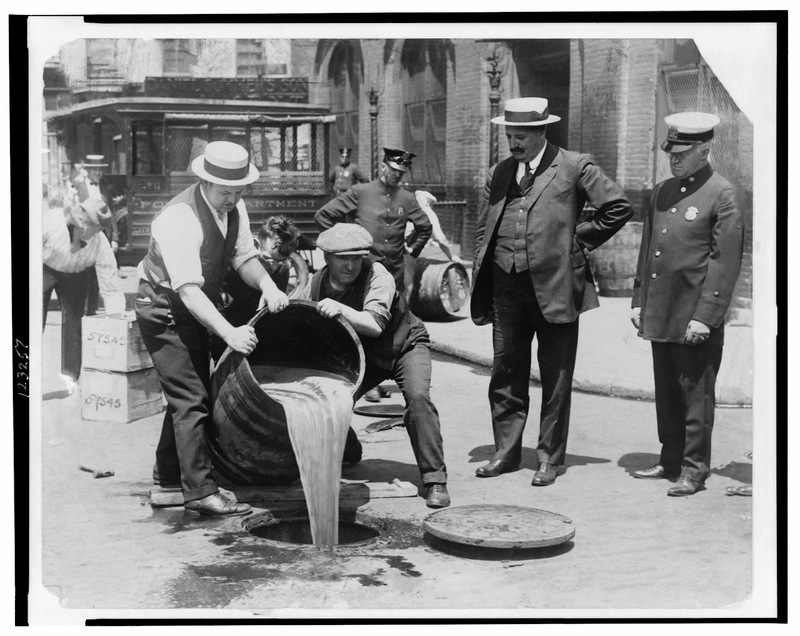 Bootlegging couldn't really be stopped, though... there weren't enough officers dedicated to enforcing Prohibition. The states wanted the feds to enforce it, and the feds wanted the states to enforce it. Plus, many states weakened their laws over time, and Maryland never even passed a prohibition law! The governor of NJ decided that his state would remain as wet as the Atlantic Ocean. In states that did want to enforce the law, where would they get the money? $698,855 was spent on enforcing Prohibition by all 48 states in a single year, which was less than 1/8 authorized for fish & game! - Eventually, however, enforcement happened. On March 22, 1920, at an isolated dock north of Seattle, 11 men brought in Canadian whiskey into waiting automobiles. Their route back was blocked by a dozen Prohibition Agents, who shot and arrested the men. One culprit was a police lieutenant - he lost his job and paid a fine... then became King of the Puget Sound Bootleggers, one of the biggest employers in the Seattle area. Soon, he was making more in one week than he'd make in 20 years as a policeman! He bought local officials, sherriff's deputies, city council members, the mayor, and more. He forbade his men from carrying firearms. He had no shame. - NYC was Prohibition's biggest challenge - bars on every block and whatnot. There were also stores in Manhattan that sold liquor, though they didn't advertise it and gave some to the cops every week to stay in business. Thousands of speakeasies were opened, and soon, they needed officers to watch the policemen! 200 agents weren't enough, but 2,000 wouldn't have been enough, either. About half of the agents in New York had to be fired in one year because of the corruption. Stricter laws were passed, making carrying a flask as punishable as carrying a handgun. But, then too many people were doing Prohibition and not dealing with robberies and other crimes, and the federal judges were angry that all they heard all day were alcohol cases so they let people plead guilty, pay fines, and go. - Prohibition created opportunities for small-time criminals. Jewish mobs controlled Philadelphia, Newark, and big hunks of NY (which was too big for a single mobster and caused a 12-year gang war that cost hundreds of lives). In Chicago, murder & mayhem became synonymous for a generation. There was a "milk" company with uniforms, a truck, and bottles to deliver moonshine and nobody was the wiser. - Cities used to be in a competitions of sorts to see who was the "wettest." Prohibition agents liked to see how quickly it took to get a drink.... in New Orleans it only took 35 seconds until a taxi driver offered an officer a swig. Part 3: "A National of Hypocrites"
- The US became the biggest importer of cocktail shakers in the world during Prohibition. The popularity of drinking kept increasing... after all, all you needed for a speakeasy was two bottles and a room. A police commissioner estimated that there were 32,000 speakeasies in NYC, one for every 243 inhabitants. Some people were getting fancy in the deluxe speakeasies - a glass of sherry before meals, a bottle of wine at dinner, a port with the cheese, and a liqueur with the coffee. Women were drinking with men now, which didn't happen before Prohibition. Plus, the older women are upset that the younger ones are drinking - something that they had fought so hard against. - Raids closed down 11 of the biggest speakeasies in Manhattan the day after Governor Al Smith accepted the Democratic nomination for President (though he ultimately lost the presidency to Hoover... by SIX MILLION votes!). Many felt that it was the staunch Prohibitionists that made the law not work... if they had let it be amended a little, perhaps it would have fit the country better. Then, because the Anti-Saloon league knew that they had to protect Prohibition, they controlled the state legislatures and stopped reapportionment in Congress in 1922, 1924, 1926, 1928 to keep down representation in the cities. - TA bunch of gangsters went to Atlantic City to build a National Crime Syndicate, dividing up territories and using the Federal Reserve bank's grid to determine the zones. Meanwhile, the government ordered poisoning be put into industrial alcohol to discourage it being used for human consumption. - Capone was a real media hound in Chicago, inviting newspaper reporters for interviews, holding press conferences, and giving away signed autographs at baseball games, $100,000 of stuff for Christmas, and more. Although he considered himself a public benefactor, he kept 18 body guards at all times. When the Depression began to ravage the country, Capone set up a soup kitchen in Chicago. - Hoover wanted Capone in jail, so when the Supreme Court announced that illegal income was taxable, the government spent two years trying to build any case they could against him. But, Capone was smart - he kept no books, had no bank accounts, and did everything in cash. His Florida home was in his wife's name, and was still bought in cash. He also spent so much that it was hard to show that he really had any income! But, finally, on June 5th, 1931, Al Capone was indicted on 22 counts of income tax evasion. The trial lasted 10 days, and most jurors were paid off or threatened... but the judge brought in a new pool at the last minute, and on October 24, 1931 - he gets the stiffest penalty ever given to a tax evader - 11 years in federal prison. Capone blamed his publicity for being what caught him. - If we got rid of Prohibition, the government would get more tax money PLUS there would be hundreds of thousands of jobs again. "Beer for taxation, jobs for millions" was one slogan. It was FDR (who carried 42/48 states) who repealed the Volstead Act immediately, and even brought up the 21st amendment (to nullify the 18th) before he was even inaugurated. It passed 63-23 in the Senate and 289-121 in the House. Within 9 days of taking office, FDR told Congress to reorganize the banks, cut federal spending, and pass a bill to legalize 3.2% beer. The bill passed both houses easily. On April 7, 1933, Americans could legally buy beer for the first time since 1920. - It took less than a year to repeal the dry law. On 5:32pm ET, December 5th, 1933, Prohibition came to an end after 13 years, 10 months, and 18 days. The effects outlasted it, though - many states and counties stayed dry for decades! Oklahoma didn't vote for the appeal until 1959. - In 1935, A NY stock broker and an Ohio surgeon started AA, which now has millions of members.